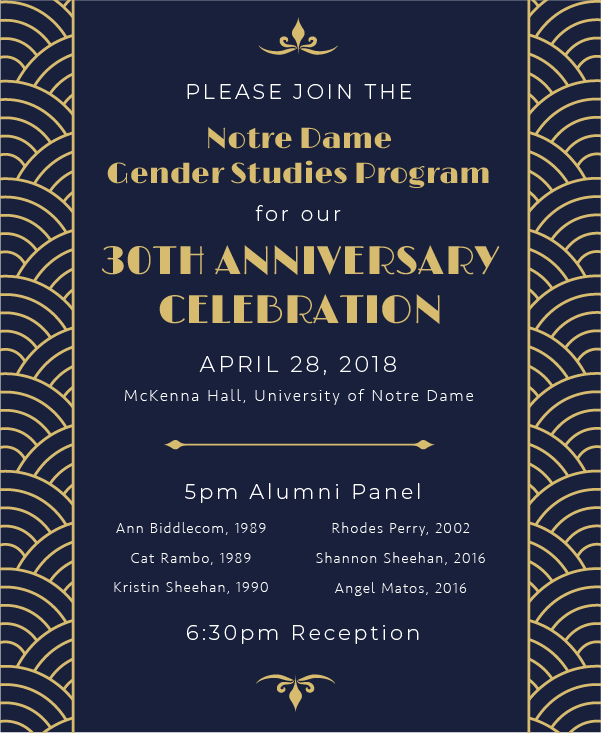 This Saturday I’ll be speaking at the University of Notre Dame’s 30th Anniversary Celebration of its Gender Studies Program. I am so honored to join a panel discussion with five fellow graduates of the program. Together we will share how our gender studies degrees have shaped our experiences in the world since graduation. We’ll be joining students, faculty, and staff in celebrating the extraordinary accomplishments of the Program over the past three decades, while connecting with students and learning more about their scholarship. As I prepare for this exciting opportunity, it’s difficult for me to talk about life after graduation without first reflecting upon how profoundly my campus experiences have influenced who I am in the world. Life leading up to graduation involved not only rigorous studies and plenty of student activities, but also the hard work of accepting myself – particularly my sexual orientation, gender identity, and spirituality. Reconciling my Catholic faith while coming out at Notre Dame was not an easy process, though it was a rite of passage I’m grateful for - it allowed me to self-actualize who I am by clarifying what I believe and want for my life and the world. Despite the University’s Spirit of Inclusion statement, it was very clear from the day I came out on campus that LGBTQ people were indeed “strangers and sojourners.” At the time, the University’s Student Affairs Department did not recognize the LGBTQ student-led organization, OUTreachND. Without University recognition, our student group could not access the funding needed to welcome prominent LGBTQ & ally advocates working to make the world a better place for our communities. It also sent a very clear message to many of us that the University wasn’t prepared nor motivated to truly include LGBTQ students like us. While coming out on campus, my life-line was the Gender Studies Program, which served as an invaluable resource for so many of us LGBTQ students - no matter our majors. The Program provided the resources necessary to travel to incredible conferences like Creating Change, and connecting with the University’s LGBTQ alumni group. One of my most vivid memories during this time was visiting LGBTQ alumni in Chicago for a social gathering. The trip was completely transformative as it was one of the first times I had the opportunity to connect with successful, happy, and healthy LGBTQ adults thriving in their lives. Meeting LGBTQ alumni as an undergrad signaled that there was a world of acceptance waiting for me on the other side of graduation. Having this confidence of knowing I too could lead a happy and healthy adult life, I worked with a committed group of fellow LGBTQ & ally students on campus to raise awareness about the University’s lack of LGBTQ inclusive non-discrimination protections. When we weren’t busy with our studies, we were committed to participating in hunger strikes, meeting with University Trustees, and educating anyone who would listen about why it was so essential to create a campus that was welcoming for our rainbow family. While we didn’t change the University’s policy, we did win over many allies by opening more hearts and minds during our time on campus. My experiences at Notre Dame inspired me to dedicate my career to social justice. One of my first opportunities engaging with this work involved serving as a communications intern at the National Organization for Women in 2001. While working for the organization, we were preparing for a major organization vote where members were asked whether they wanted to expand the definition of women to include transgender women. As a transgender guy, it was incredibly meaningful when the membership overwhelmingly voted in favor of including transgender women into the organization’s mission and strategic goals. Over the past two decades, I have had the pleasure of working at the White House, PFLAG National and the City of New York, working on social justice matters that have expanded basic rights and economic opportunities for women, people of color, LGBTQ people, people with disabilities, low-income communities, and those living at the intersections. What drives much of my advocacy is knowing how important it is to cultivate cultures of belonging for those that often feel overlooked, marginalized, or unworthy. I believe it’s possible to welcome and include those in the same fashion that the University of Notre Dame’s Gender Studies Program welcomed me, along with so many other LGBTQ students. Today, I now own a management consulting firm where I get to apply social justice principles to help business leaders cultivate workplace cultures of belonging. Based on my experiences of coming out at Notre Dame, being embraced by stakeholders within the Gender Studies Program, and living a life on purpose, I believe in the power of bringing authenticity into everyday life, including the workplace. I have seen first-hand how leaders within Notre Dame’s Gender Studies Program continue to create a campus of belonging for some of the most disenfranchised students, and because of this connection, it continues to inspire me to support business leaders as they do the work necessary to help their people feel a sense of respect, purpose, and belonging. I hold great confidence that the University of Notre Dame will one day join leading Catholic Universities in the United States like Georgetown in truly welcoming, protecting, and embracing its LGBTQ students. Much of my confidence comes from the incredible leadership demonstrated by the Gender Studies Program. With faculty and staff most knowledgeable about LGBTQ communities, it makes sense that this leadership has the knowledge, skills, and confidence to continue to push key decision-makers to create a more inclusive campus where LGBTQ people know that they belong.